Kyrie Irving is an Australian-born American basketball player who began his professional career in 2011. He was selected by the Cleveland Cavaliers of the National Basketball Association (NBA) in that year’s draft and played with the team for six seasons before moving on to the Boston Celtics. During his first professional season, the point guard was named NBA Rookie of the Year and is now a five-time NBA All-Star. In 2015, he was selected to the All-NBA Third Team. Born on March 23, 1992, in Melbourne, Australia, the basketball player was raised in West Orange, New Jersey. His father was a basketball player and as a young boy, Kyrie would often go to see his adult-league games. Being the son of a player, he grew to love the game and when he was in fourth grade, he made up his mind to play in the NBA after taking part in basketball games at Continental Airlines Arena during a school trip. He did not only say that he was going to play in the professional league but also took it a step further by writing, “I will play in the NBA, I promise”, on the door of his closet and underlined the last phrase three times. Kyrie Irving attended Montclair Kimberley Academy in his first two years of high school and became the second 1,000 point scorer in the school. He later transferred to St. Patrick High School where he sat out the first 30 days of the season as a result of transfer rules. His performance at the school was so outstanding that he was said to be one of the best players in the class of 2011. Irving continued his football career playing for the Duke Blue Devils of the Duke University before he forwent his last three seasons of eligibility in favor of the 2011 NBA draft. At the draft, the Cleveland Cavaliers selected him with the first overall pick. Different publications have quoted several contradictory figures as Kyrie Irving’s net worth. Although we cannot categorically state how much his net worth is, we are sure that it runs into millions of dollars. He makes his money not only from basketball but also from endorsement deals and from the sales of his Kyrie 3 signature shoe collection. The basketball player is a stakeholder in the American company, Skullcandy. He also acts in TV commercials and has written/directed some episodes of Uncle Drew, an advertisement-series for PepsiCo, in which he starred too. In 2012, he acted in an episode of a TV series, Kickin’ It, aired on Disney XD. In 2015/2016, Kyrie Irving signed a 5-year contract with the Boston Celtics worth $94,343,126. While the amount is completely guaranteed, it left his annual average salary at $18,868,625. In the 2018-2019 season, he will cash home a base salary of $20,099,188, while carrying a cap hit of $20,099,188 and a dead cap value of $41,428,938. According to Forbes, the Celtics point guard is the highest-paid professional athlete in the team. He ranks 29th on Forbes’ recently published list of the world’s highest-paid athletes and is the 7th basketballer on the list. According to the publication, Kyrie Irving makes $36.1 million annually from both salary and endorsements. 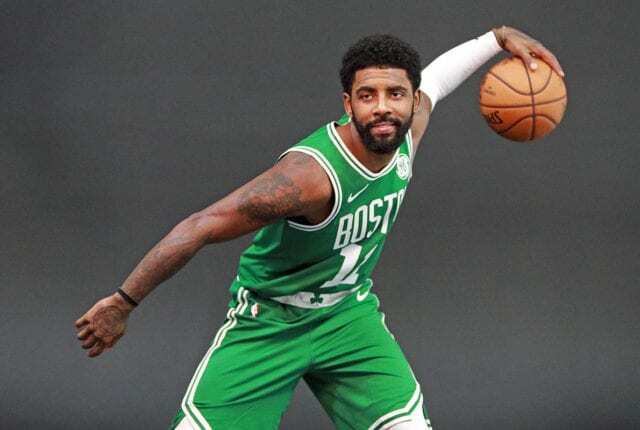 Kyrie Irving is the son of Drederick Irving and late Elizabeth Irving. His father, a former basketball player, was born on January 11, 1966, in New York City and was raised by his mother Lillian Irving, in Bronx’s Mitchel housing projects, alongside his six siblings. Drederick’s father abandoned the family when he was a toddler and as a result, his mother had to work two jobs to provide for her children. Dred, as he is fondly called, attended Stevenson High School in The Bronx, where he played basketball before continuing with his college career at Boston University. He was among the most productive players in the history of Boston University and was once ranked first in career scoring for the Terriers (he’s now third). He was an all-conference selection in 1986 and 1988, and the team’s Most Valuable Player in 1988. Following his graduation from the college with a degree in Economics, the school retired his jersey No. 11 in 1988 and made him a member of the Boston University Athletic Hall of Fame. After his college career, Kyrie Irving’s dad received an invitation to join the Boston Celtics training camp roster but was later waived. He subsequently secured a job with a finance company where he worked as a credit manager until he relocated with his wife to Melbourne, Australia, in 1992. There, he played professionally for the Bulleen Boomers in the South East Australian Basketball League (SEABL). He played for the team in the 1992 season having signed a contract with them and dominated the league scoring at 30ppg. Drederick met his first wife, Elizabeth Larson, at Boston University. She was a member of the school’s volleyball team, a trained pianist (classical) and the daughter of a Lutheran clergyman. They started dating in school and tied the knot soon after they graduated. The couple gave birth to their two children (Asia and Kyrie Irving) in Australia before relocating back to the US in 1994. Two years later, Elizabeth got sick with sepsis and passed on at the age of 29. Irving who was just four years old when his mother died, was raised by his father with the help of his aunts. His father eventually got married again to a lady named Shetellia Irving and together, they have a daughter named London. Irving’s older sister, Asia, is an aspiring model. On November 23, 2015, Kyrie Irving welcomed a daughter named Azurie Elizabeth with his former girlfriend and Texas beauty queen, Andrea Wilson. He named the little princess after his late mother, Elizabeth Irving. The talented player has a long list of ex-girlfriends with whom he started relationships that never made it to the altar. Like his previous relationships, his relationship with his baby mama also did not survive beyond a certain time. Though it was never a smooth one, things became worse between the couple after the birth of their daughter. However, he is very much present in his baby’s life and pays $4,500 in child support to Wilson. The 6 feet 3 inches (191 cm) player weighs 88kg (193 pounds).